Howdy friends! How was your Christmas? I hope that it was completely magical and full of blessings. I know that some of you are already ahead of the game, and have moved on from Christmas and packed up your things. I, however, have not. I can't help but want to hold on to that sparkle for a few extra days after Christmas is over, so I wait until New Year's day to put away the pretty lights and holiday bling and return to our version of normal. First, let's chat about gift giving, since that is really a huge part of the season. 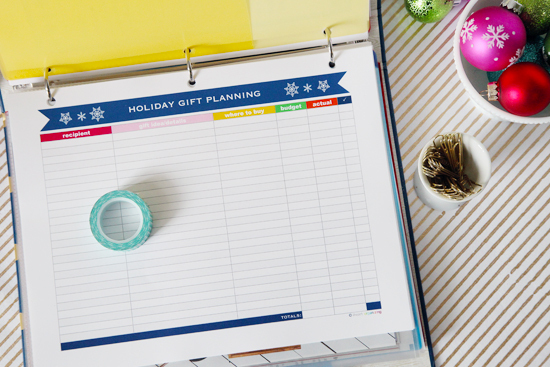 One thing that I have loved year after year is my Gift Giving Tracker. However, something new that helped me when it came time to wrap all of those happy little packages was our new gift wrap station! For those looking for other great wrapping stations, I am still gaga for this over-the-door awesomeness created by my gal pal Cassie! If you are looking to tote around your gift wrapping essentials, you must check out this amazing DIY caddy created from a fast food cardboard drink carrier. When you have the space, it is great if you can carve out a little nook of your home for gift wrapping away from the kitchen table. I love this happy office corner, which can be used all month long for last minute gift wrapping sessions. 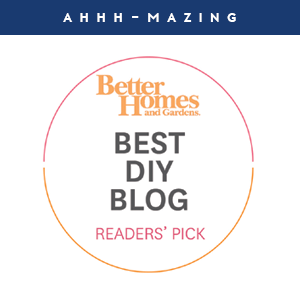 If you are at all like me and use your ribbon year round, check out this smart solution which pairs dowels and a plastic basket for rockin' ribbon storage! And once the gifts for the kiddos are all wrapped and pretty, organize hide them inside a storage trunk until Christmas Eve. But how about organizing all of those decorations? Many of us sprinkle Christmas throughout our entire home, and even trim a tree. So many things to store away nice and neat! Tip number one is to always add a sleeve or clear pocket to each bin, so that you can easily tuck a contents list inside. This will prevent rummaging next year! Tip number two is to fall in love with Ziploc bags and Gladware containers! 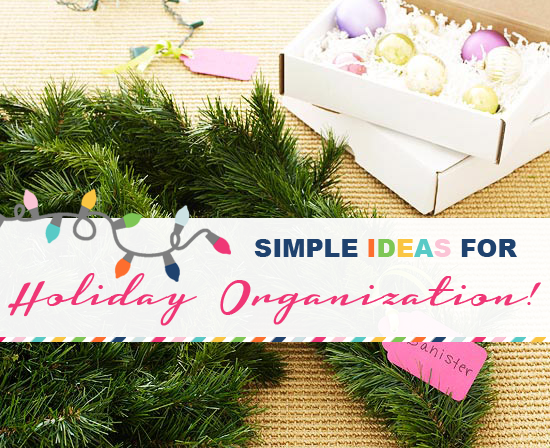 I try to reduce my use of them in my day to day life, but when it comes to storing itty bits and even those shatterproof ornaments, they are my go to organizers! Tip number three is to wrap the rest around cardboard! The cardboard wrap method prevents items from tangling and works for everything from lights to garland; and is a simple and free solution! Tension rods work great as well! 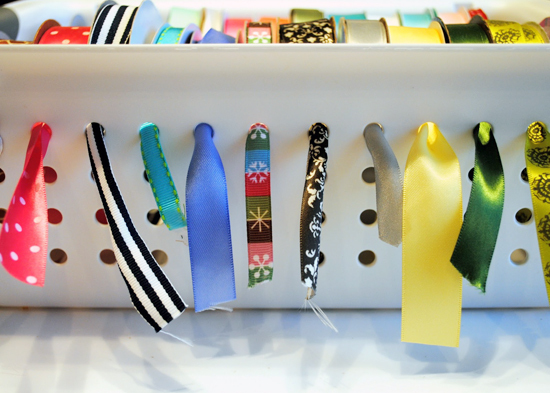 I am also simply smitten with this alternative solution to cords and strands, which is to wrap them with Velcro strips. Easy peasy! Or maybe egg cartons tickle your fancy? I am sure you have seen it 100 times, but the plastic cup glued to cardboard stacking trick is pure genius! 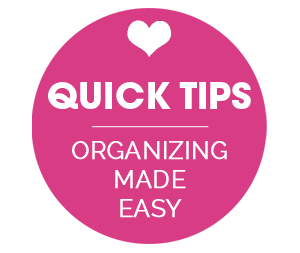 Tip number four is to pack things up as if you were unpacking them! 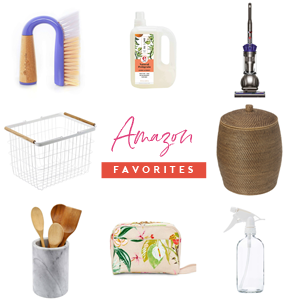 Place less used items at the bottom, frequently used or the first items use decorate with, at the top. Make things as simple as you can for next year. 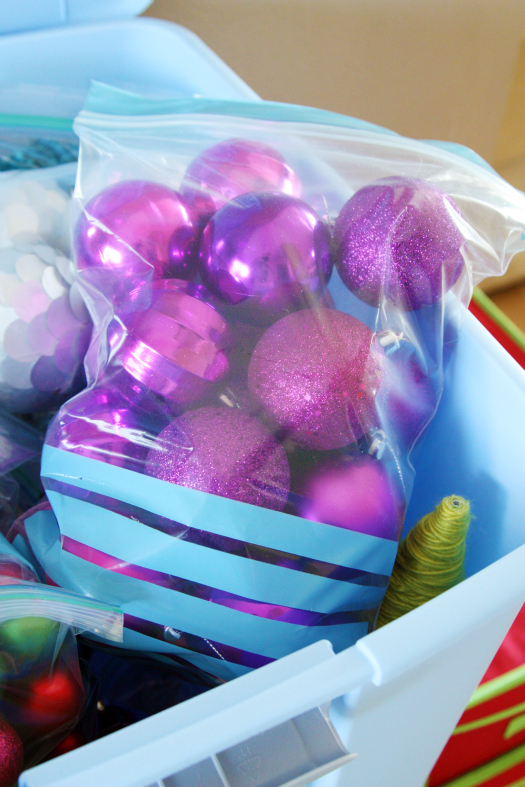 Also, keep original packaging and even use gift boxes to provide storage inside of storage for those ornaments and special decor pieces. Last but not least, tip number five is to store all Christmas decor in similar style and colored bins for easy identification. This will ensure you are only grabbing at bins that matter most during the holidays, and not left searching amongst bins of memorabilia and auntie May's fine china. 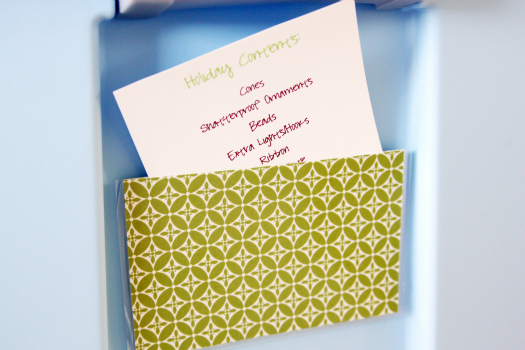 I am head over heels for these stackable divided bins used by Katrina of the Organized Housewife! 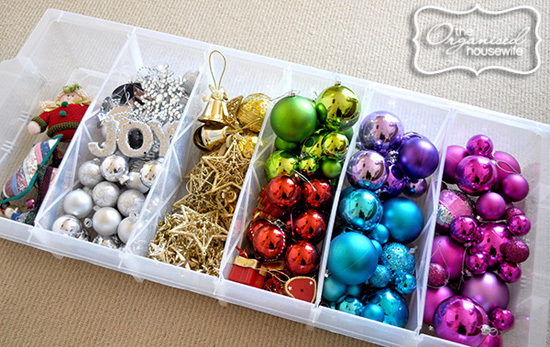 They are so wonderful for dividing ornaments by category and separating decor types. 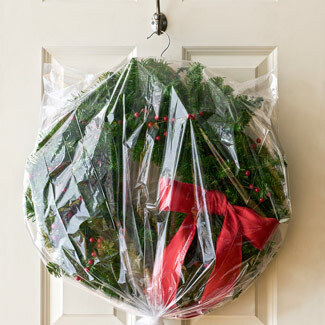 When it comes to storing a Christmas wreath, I have tried those hard sided bins and they only work well if you have a wreath small enough to fit inside. So happy I stumbled upon this idea to use a hanger paired with a dry cleaning bag for my additional storage-less wreaths! Do you display the lovely faces of friends and family that grace your mailbox in the form of greetings throughout the month of December? How freakin' adorable is this card display crafted from an old window shutter? But what do you do with those cards once the year has come and gone? 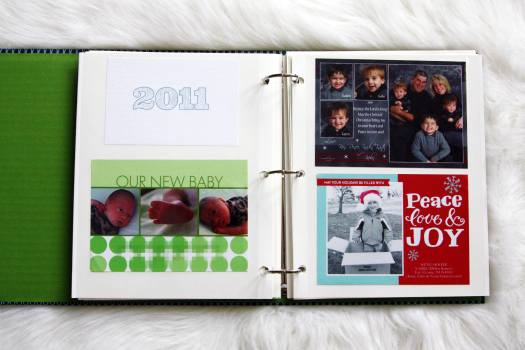 I don't keep them all, but the ones with family photos get stored away in a special greeting card binder. You can't go wrong by just paper punching them and placing them on a ring by year. Simple. Adorable. And memorable! Last but not least, this little holiday binder didn't leave my side this season. It worked out great, and I look forward to adding to it for years to come! Even my guys used it a few times, which of course, made me warm and fuzzy inside. 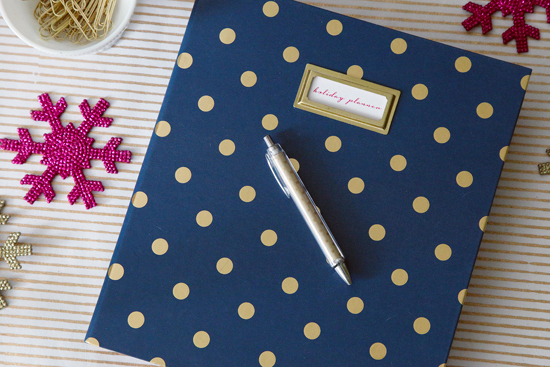 So who is geared up to do a little extra organizing this year, to ensure next year goes off without a hitch? 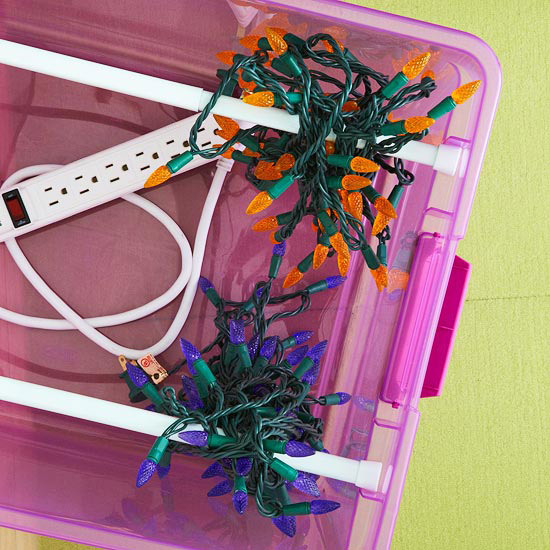 What are your favorite Christmas and holiday storage and organizing tips? Anything work particularly well for you this year? Image used for header graphic found here. I always wind my lights up in little bundles, with a light at each end, just back and forth so the wire is in the middle. Last year I bundled the matching ones in big ziplocs. 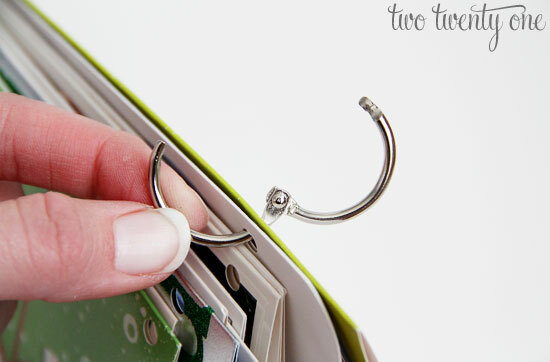 I love that Christmas card binder idea! We never know what to do with ours! Great ideas! We also take everything down on New Years! I have a couple of special ornament containers I bought a few years ago that I love. Then I bought extension cord reels for my lights. Those and other stuff just go in clear plastic totes. Works well. The thing I'm struggling with is icicle lights. We left them up on the house year-round but I wanted them down this year. Being left out all the time caused them damage from the wind. But some of them still work so I don't want to get rid of every strand. But they are hard to store because of the strands that dangle down. Cut long cardboard strips that will fit lengthwise into a plastic bin. Wrap icicle lights the long way around the cardboard. Stand each wrap inside the bin. This will keep the icicle dangles from tangling. Thanks so much for the tip Anonymous! We haven't done the icicle lights yet so I am clueless how to store them. xoxo! This is great! I love the cups glued to cardboard! I created a google doc a few years ago to track holiday gift purchases and to add ideas as we thought of them. To stay organized each year we create a new tab on the spreadsheet. It's great to be able to reference what we gave the year prior to avoid duplicates and to pop in notes as we shop/wrap/mail/pack. Such a great idea! I bet it makes things easier year after year! Love it! Great ideas! I always put my Christmas cards on a ring and pull out the next year. 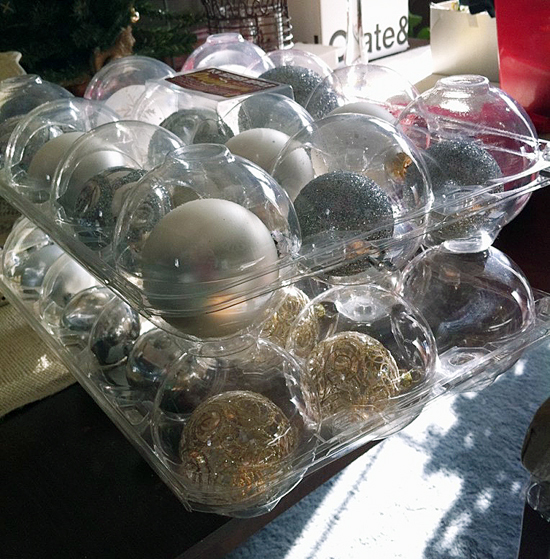 I cut up cardboard boxes and used them (with a heavy amount of packing tape) as section dividers in large rubbermaid tubs for my large collection of shatterproof bulbs. Each regular-sized ornament has its own section based on color; then I have one section for jumbo ornaments. 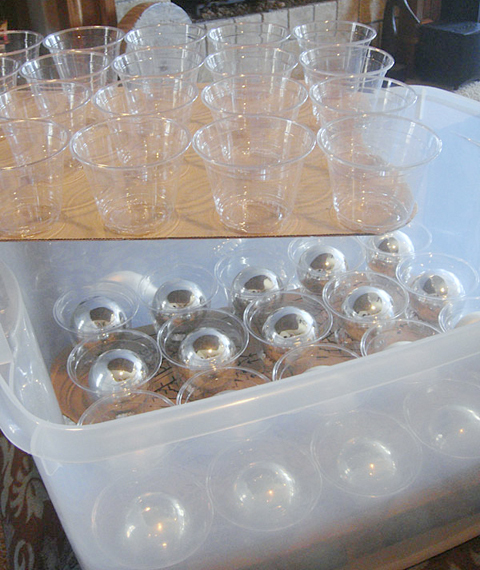 Little bulbs (ping pong-ball sized and smaller) all go in large Ziplocs based on color/type. It makes decorating and packing it all away again, so much easier. One of the things I have ultimate disdain for is the cleanup after Christmas, but you make it seem easy and fun! 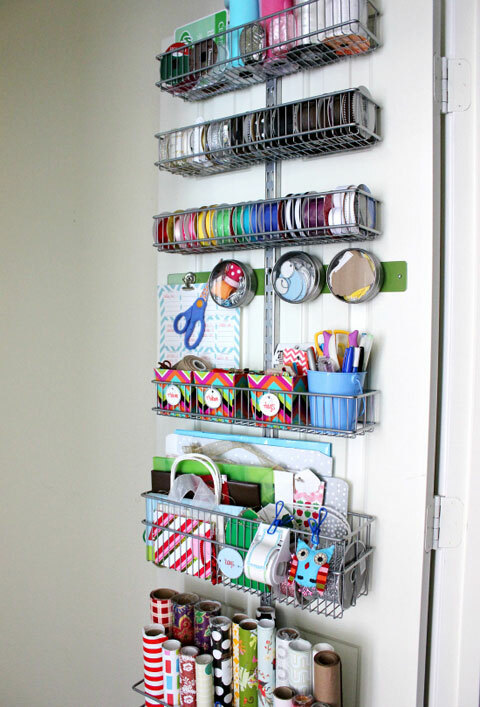 Love these organizing ideas! Great post. 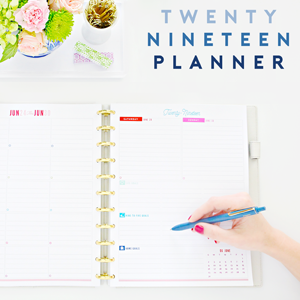 I've really been reading up on your blog, I want to start the new year fresh and more organized. ps I saw your feature in this month's BHG mag. I guess you'll have another mag to add to the memory box! I took your advice and also made a Holiday Binder! It saved me more times than I care to admit! My holiday party menus, tracking lists and to do lists were all neatly organized along with all receipts! Thank you for sharing your wonderful ideas! 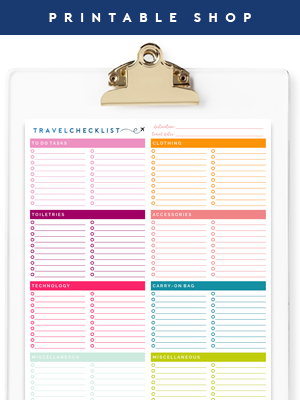 Because of you, I am a more organized person! That is WONDERFUL news! Thanks so much and I am so happy the binder was helpful this year! Last year I was so frustrated when I undecorated. I bought two big plastic tubs, hoping to consolidate a few smaller boxes. All I ended up with was everything I had before plus two big plastic tubs. :) But those two tubs were great this year because in them I placed specific decorations for specific places. So when it came time to decorate, everything I needed was all together. For example, everything that goes on the mantle was in one box. Everything that came off the mantle went into the same box for storage until after Christmas. So now I just do the reverse. Sweet. This may not be a perfect solution as sometimes we use decorations in different ways/locations as the mood strikes, but it was nice having everything together and I will continue in that vein as I undecorate this year in preparation for next year. Happy New Year! Of all the new years posts out there, this might be the most inspiring! 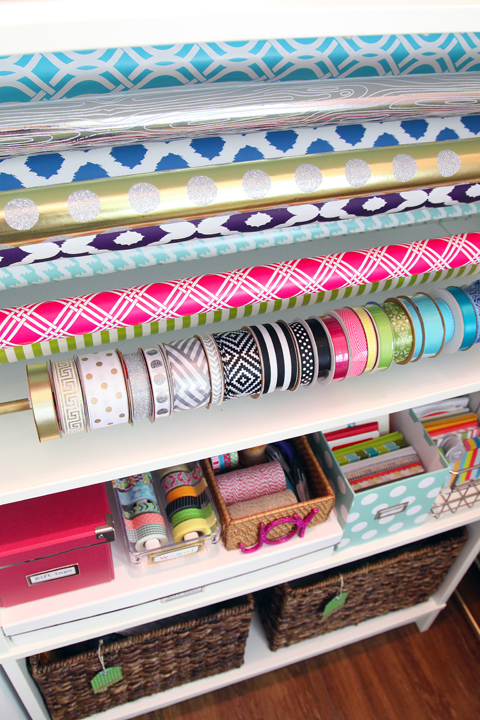 Your gift wrap station makes me organization-loving heart swoon. Thanks Bethany! And mine too, I go gaze at it daily! Now, if I could break myself away and get things done, lol! Love your blog and follow it daily. I use the pockets on the outside of storage boxes, too. I also snap a quick picture of the contents and include that. It helps remind me of what I already have when I go shopping. Love the picture idea Julie! Anyone have any ideas on how to store an ornament wreath. Mine seems pretty fragile, but won't fit in a regular hard sided wreath container. That door organizer is brilliant! I missed the original post but I'm so glad I saw this. Everything I have is in bags/containers on the floor and there's something about cluttered floors that is so overwhelming. These are great ideas! I'll tell the family about them because I know that I had some headaches keeping everything organized (or attempting to do so, at least)! Great ideas - thank you! 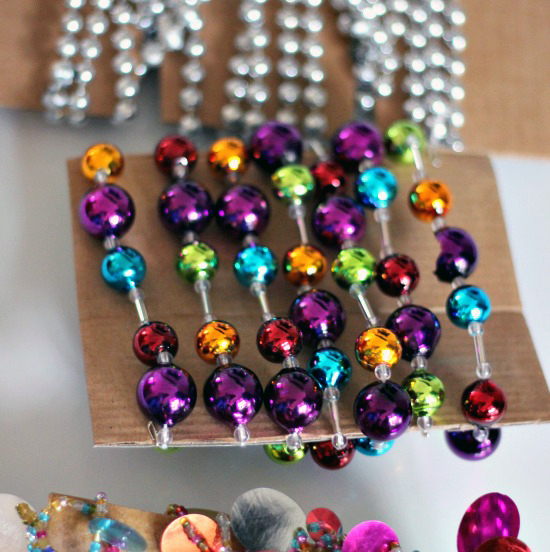 - I particularly like the egg carton for baubles as they are such an awkward size to recycle and this puts them to great use! 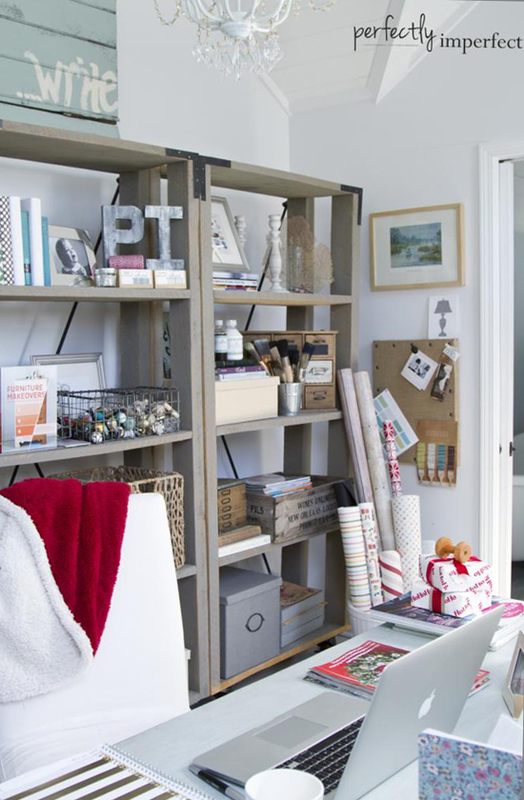 Forget Christmas decor-- it's the storage and organizing that's really pretty! Seriously, so much beautiful eye candy in a post about storage! I love it! Thanks for all of the tips, tricks, and ideas, Miss Jen! I hope you had a happy New Year! Hahaha! I tend to agree most days! ;) Happy New Year Abby! These are all wonderful ideas! 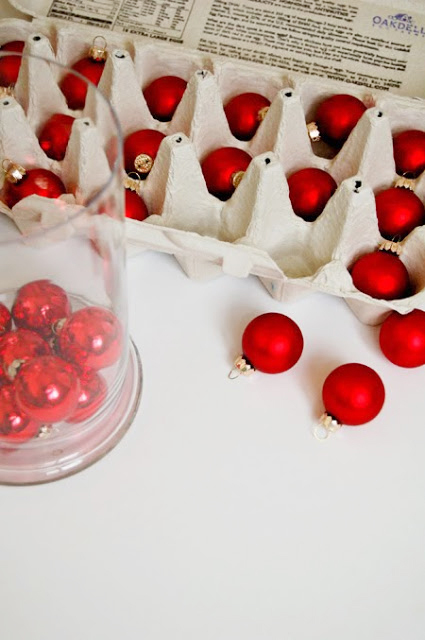 I had never thought of using an egg carton I might try that with my smaller ornaments, Thanks! Some nice organizing Christmas ideas here, like the list attached to the bin best. All excellent ideas. I use the first in, less used mentality on my Christmas packing. I decorate the same pretty much each year, so I put the things that go in certain places packed together. 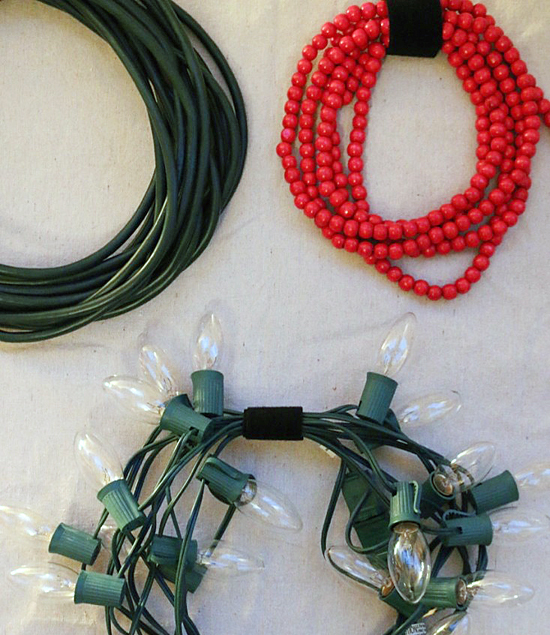 My #1 tip that I use is to put each strand of lights (after being carefully wound up in a circle) in it's own plastic bag, which I reuse from department stores, grocery stores, etc. Then I put all the bags into one. My light strands are never tangled together, and I feel I am being a bit green by reusing the bags. 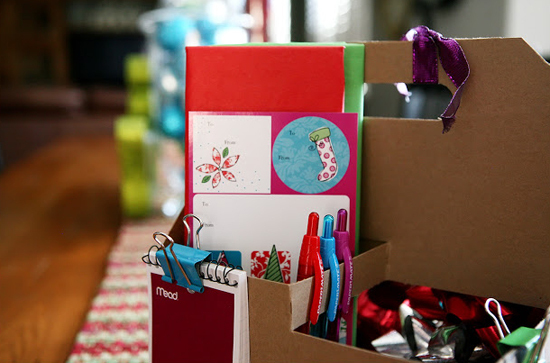 I love all these ideas, especially wrapping around a card board. Thanks Jen for including my organised baubles storage box, I love this box makes it so easy to colour coordinate our tree each year! Yes, that's a great idea to use old cardboard boxes, egg boxes and to wrap your lights round cardboard tubes etc. But PLEASE don't buy extra plastic boxes, glasses etc to store your decorations in. There is so much plastic out there in the world already! Why waste money on plastic storage tubs when you can get cardboard boxes for free from shops?